It's San Francisco's time to strike. I love me a good tune. And I really love sports radio. Well, one San Francisco station, 95.7 The Game, offered up its contribution to the Seahawks-49ers clash set to go down on Sunday in the form of a parody song. Hooo boy. 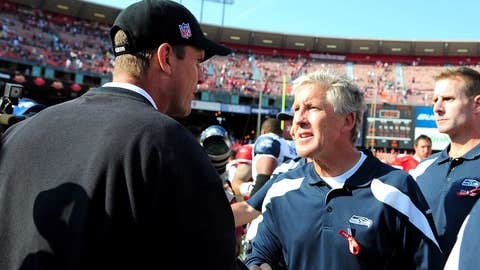 Set to the tune of Neil Diamond’s "Sweet Caroline," comes a ditty called "Pete Carroll whines." Take a listen. As far as parody songs go, it’s not bad, if you’re into that type of thing. And yes, the chorus says "Pete Carroll whines, Adderall makes his team good." It guess it’s funny because the Seahawks have had a couple players suspended (Brandon Browner in 2012, Bruce Irvin this season) over the past couple of the seasons for the use of the drug. Topical!